Lifeline® Normal Human Bronchial Tracheal Smooth Muscle Cells (HBTSMC), when grown in Lifeline® VascuLife® SMC Medium, provide an ideal low serum (5%) culture model for the study of pulmonary biology. Human Bronchial/Tracheal Smooth Muscle Cells have been isolated from human bronchi and trachea and cryopreserved as primary cells. 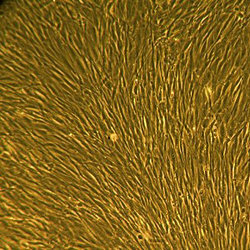 Primary cells are cells that have been isolated from tissue, plated onto culture vessels, expanded, harvested and cryopreserved. Bronchial/Tracheal Smooth Muscle Cells can be grown without phenol red or antimicrobials when cultured in VascuLife® SMC Medium.